Encrypting iPhone back up is very important if you want to protect your information from others, this is a pretty simple procedure which is often overlooked by many who don’t know its importance. This will help us protect our personal and particularly important information from others. I guess too most people these are personal stuff which will be preferred to be kept away from others, so i guess this intrusion into your privacy is enough to take care to Encrypt your iPhone Backup wile Backing up your iPhone. This can be particularly useful for High end professional and politicians and people who prefer to have a safe and easy to access place to keep their information. Plug in your iPhone or iPad into your Windows PC or Mac’s USB port and launch iTunes. You can now see your Device in the left side Devices pane in your iTunes from where you will have to Select your device under “Devices” in iTunes. 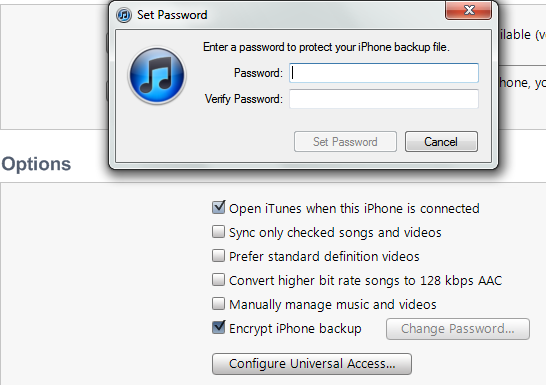 After which there will be a Summary page opening in your iTunes, which will be showing information regarding your iPhone and various other things apart from the “Encrypt your iPhone Backup” option which we need. Choose a password that will be used to access your phone’s backups. There is an option seen in the dialogue box when you are entering your password stating “Remember this password in my keychain” which should be selected only if you are confidant about your privacy or else there is no use of using a password which can be accessed by everyone.